Her nose isn't coated in bright white sunblock, but she might just save your life. EMILY, or the Emergency Integrated Lifesaving Lanyard, is a robotic buoy that can swim through riptides at a speed of up to 24 m.p.h. 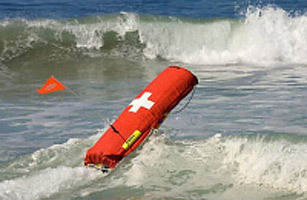 Her inventor, entrepreneur and engineer Tony Mulligan, says that makes her about 15 times as fast as human lifeguards. Powered with a tiny electric pump that shoots a forceful stream of water, the 4-ft.-long robotic buoy has been tested at California's Zuma Beach. The device is operated by remote, but next year's model features sonar technology controlled with an iPhone app that will allow EMILY to detect riptides and submerged objects.